I know this is so terribly belated, but I was really excited on the 17th. I never thought I would miss flag ceremony so much! Anyway, can't think of better choice of food when it comes to celebrating, Indonesian-way. We even do competition of making it at high school's independence day celebration. Nasi tumpeng, one hell of a feast on its own. 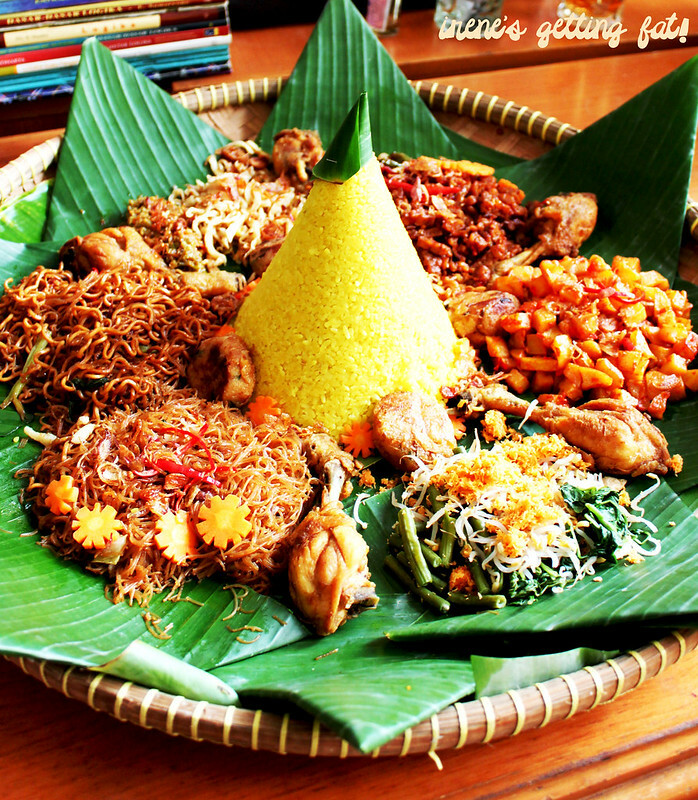 It is a grand dish, usually served for ceremonies and festivities, like birthdays, anniversaries, baby showers, and even weddings (Javanese traditional weddings). 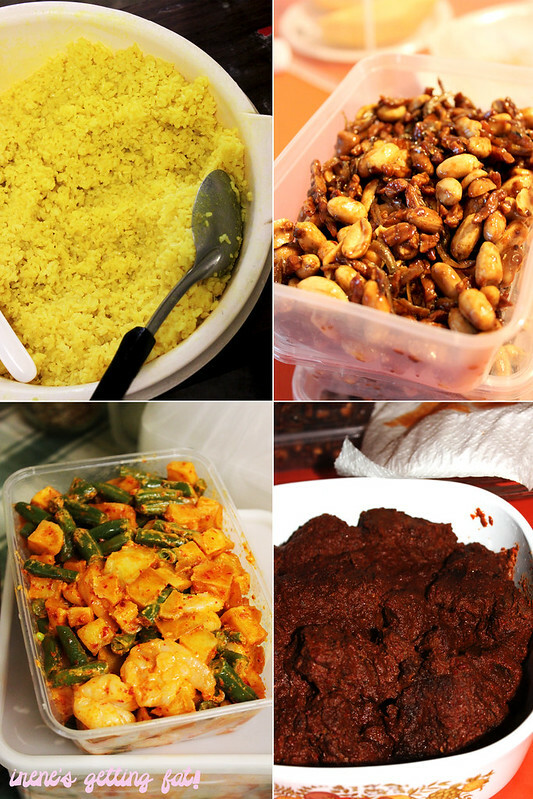 It consists of a mountain, literally, of rice (usually nasi kuning or yellow rice, rice cooked in turmeric) surrounded tightly with various side dishes like ayam goreng (spiced fried chicken), sometimes rendang, perkedel (potato croquette), eggs, urap (blanched vegetables with spicy shredded coconut topping), sambal goreng udang (prawns & veggies cooked in rich spicy gravy), teri kacang (fried caramelized bilis fish and peanuts), and decorated with fresh veggies like cucumber, chilli, and tomato. I remember that my mother and grandma used to make this for birthdays instead of buying or making birthday cake. And we were just as happy. It is said that it was 'invented' first in Java, but now the whole country (and other countries) know about the bright yellow dish served on a large pan made from weaved bamboo (which is called tampah). There is lots of details about its history and philosophy, as every part on that pan holds a specific meaning or belief. 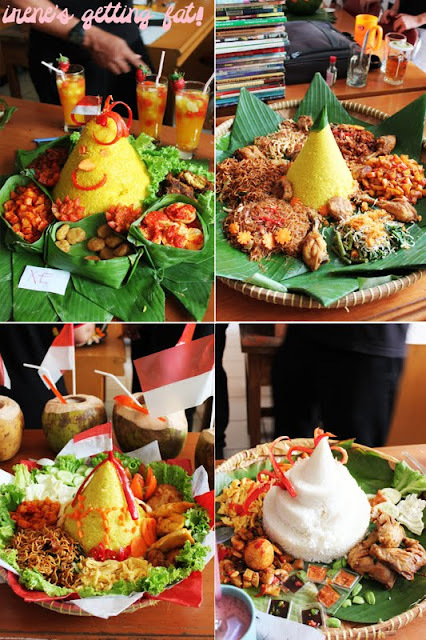 The yellow-coloured rice reflects wealth, and it is shaped like a cone to represent Indonesia's geographical trait, which has arrays of mountains, especially in Java island. Even each of the side dishes means something; fried chicken represents worship to gods, and veggies hold beliefs and hope about luck, growth, and wisdom. In the past, in every ceremony where nasi tumpeng is present, an elderly will explain every meaning of every part of the dish before they enjoy it. I don't find anything like this nowadays. Very filling, that's one. Although it depends on the mould's size, usually a medium sized nasi tumpeng can feed 10-15 people. There's a lot of rice, you know. And we haven't even started on the side dishes. 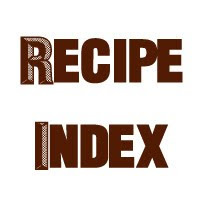 The rice itself is fragrant and rice, a result from the use of coconut milk and the other exciting spices and herbs. It goes extremely well with the spicy sambal goreng udang, the crispy fried chicken, fresh cucumber, and firm vegetables salad. A good plate of nasi tumpeng must have the regular suspects, but not one flavour should be overwhelming the other. Is it too complicated? Okay, how's this: I go crazy everytime I am presented with a full nasi tumpeng set. Usually, they make this for order only. You can get a set of nasi kuning at restaurants, which has the similar side dishes as nasi tumpeng, but not cone-shaped. In Sydney, it is so hard to find somebody that makes a full set of nasi tumpeng, I guess. If that's the case, you may have not heard about my aunt's nasi tumpeng. She makes a killer one I can't stop eating everytime she makes some. And she takes orders. Oh, just FYI, you know. I haven't made one and I'm not planning to do so anytime soon. I know how complicated it is, and it may take you a couple of days for the preparation. Think you're up for it? Then here you go, an amazing nasi tumpeng recipe from Indochine Kitchen. She somehow makes it sound simple, and the post has step-by-step picture. I haven't seen or heard of this before but my goodness is that a show stopper! It looks amazing!! Happy 17 agustus to you too!! Im missing indo food so much! 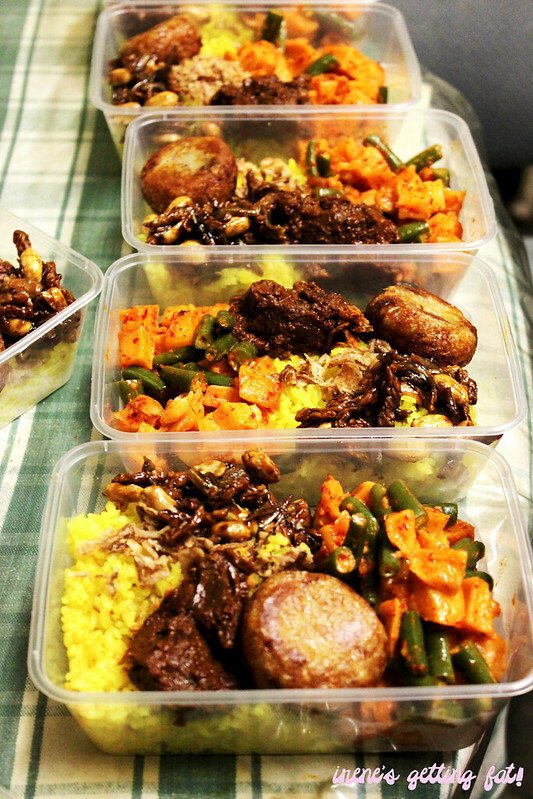 And I dont know, maybe its a small world and my monthly indo church also orders our nasi kotak from your aunt too! Love them! Really? How do you know it's my aunt's? Hehe I know right, the kids were creative. I think that one won the competition. Iya, jadi imut ya hehe. Can I get your auntie's contact details for the tumpeng order?